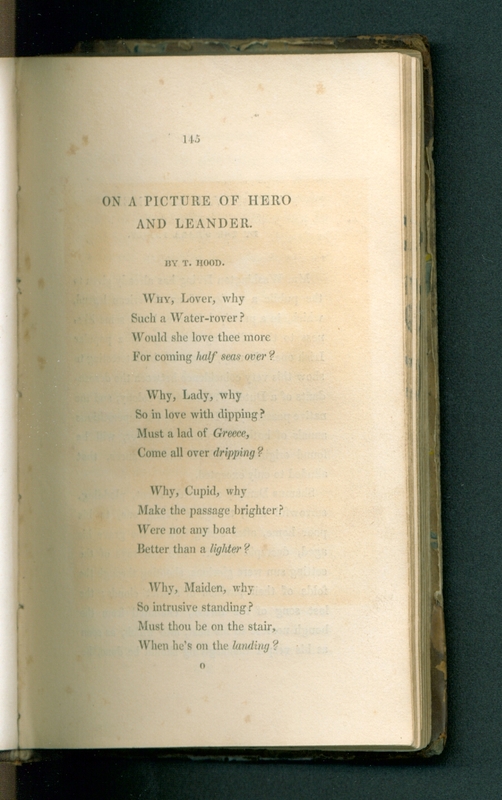 The poem did not appear in print until several years after Keats’ death in 1821. Its presence in the 1829 edition of The Gem, signed “By the late John Keats,” was its first publication (MacGillivray 80). Whether we acquit Hood of intentional mockery or not, Keats’ poem—like all poems in literary annuals—is colored by its associations with disparate works within the same volume. The sonnet shares a page with the end of the “Tom Hopkins,” a prose character study by a “Miss Mitford” (99), and is immediately followed by a serious poem of Hood’s, “The Dream of Eugene Aram” (109), which runs for nine and a half pages—giving it the slight feeling of having been squashed in. In the larger context of the volume, the sonnet’s serious treatment of a noble death resonates with that of Walter Scott’s “The Death of Keeldar” (13), which opens the volume, and with John Clare’s “To the Memory of ******” (322) which closes it. Mary Howitt’s “The Lost One” (264) too, seems to mirror the mourning of Leander’s goodness, in its enumeration of the virtues of a young boy who has died. Even Hood’s “Dream of Eugene Aram,” a tale of murder, calls back to Keats’ preceding poem in its description of the corpse sinking into the water. Drawing connections in another direction, T. K. Hervey’s “Reflection After a Picture of a Girl, lost in thought” (26) echoes Keats’ interest in the appearance of young women as they think moral thoughts. Indeed, all the many descriptions of women’s beauty take on a new dimension once Keats has encouraged us to consider them also as descriptions of internal virtue. All of these potential associations are severed when, later that same year, the sonnet is collected in “The Poetical Works of Coleridge, Shelley, and Keats,” published by Anthony and William Galignani in 1829. 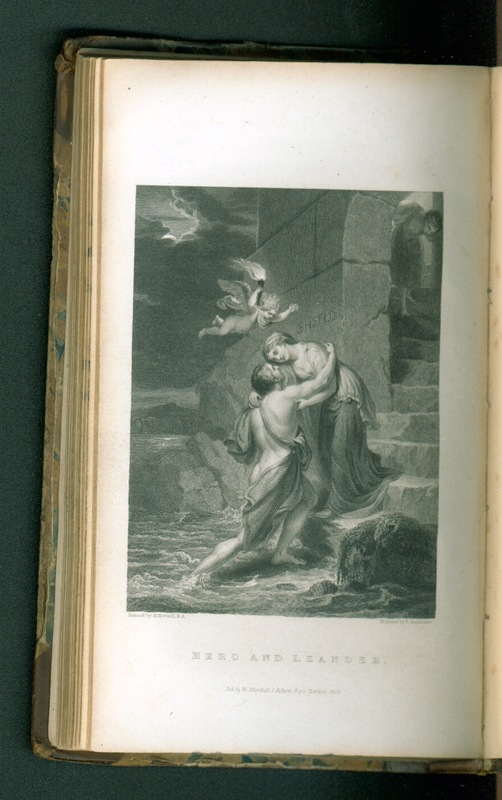 This single-volume text is the first collected edition of his works, containing his three previous poetry volumes—Poems (1817), Endymion: A Poetic Romance (1818), and Lamia, Isabella, The Eve of St. Agnes, and Other Poems (1820)—as well as “In a drear-nighted December” and the sonnets “The Human Seasons,” “On a Picture of Leander,” and “To Ailsa Rock” (MacGillivray 8). From is point on, the sonnet is included in all printings of Keats’ collected works, entering his authorial canon—surrounded only by Keats’ other posthumous poems. ON A PICTURE OF LEANDER. BY THE LATE JOHN KEATS. For Hero’s cheek, and smiles against her smile. He’s gone; up bubbles all his amorous breath! In Greek myth, Leander was a young man in love with Hero, a priestess of Aphrodite. Leander spent a summer swimming across the Hellespont (a narrow strait in Turkey) to visit her in her tower, guided by her lantern. When the summer ends, however, the weather turns, and one stormy night the wind blows out the light of Hero’s lantern. Lost in the waves, Leander drowns. Forman, Harry Buxton, ed. The Poetical Works and Other Writings of John Keats. Vol. 2. London: Reeves & Turner, 1883. Print. Hood, Thomas, ed. The Gem, a Literary Annual. London: Marshall, 1829. Print. MacGillivray, J. R. Keats: A Bilbiography and Reference Guide with an Essay on Keats’ Reputation. Toronto: University of Toronto, 1949. Print. Pinion, F. B. A Keats Chronology. Houndsmills: MacMillan, 1992. Print.